This is yet another classic ECM project. Technically it is crossover, but of such an arty and esoteric type that all thoughts of lazy commercialism are soon dispelled. The two art forms in intersection are Norwegian folk music and the work of Johann Sebastian Bach, and for those like me who are more familiar with the latter it is a fascinating juxtaposition. It's brave too; versatile as Bach's music is, it has a tendency to overshadow anything it is programmed with. But the folk singing holds its own and remains the focus of the disc, while the Bach organ and viola music takes a subsidiary role, fortunately without ever getting trampled on. Sinikka Langeland has a clear cut, strident tone in her renditions of Norwegian folk songs dedicated to the Virgin Mary. There is nothing ambient about this disc incidentally, but then ECM don't really go in for background music do they? There is some quite rustic intonation in many of these songs, boldly untempered pitches that initially stand out from the texture. As with all unusual pitch conventions, the ear eventually tunes in, but it took me a few minutes to stop hearing those few notes as just flat. Langeland also plays the kantele on some tracks. This is a Scandinavian plucked psaltery-type instrument with a narrow, but attractively resonant tone. 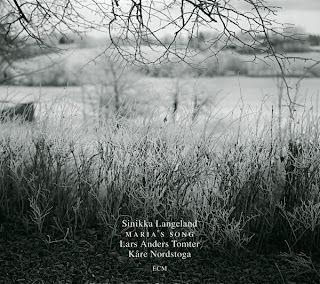 Langeland often constricts her voice tone to create nasal sounding vowels, a timbre that complements the kantele well. The Bach comes in the form of chorale preludes on the Wagner organ at the Nidaros Cathedral in Trondheim and Cello Suites played on the viola. The organ is the more successful of the two. Oragnist Kåre Nordstoga finds registrations that both demonstrate the Baroque antiquity of the instrument and fit well with the folk music. So again we hear a selection of nasal, reedy tones, but in elegant, linear music that always flows despite the often constricted timbres. In a few of the tracks, the Bach organ music actually accompanies the folk singing, an incredible achievement in many ways, not only in terms of balance, but also the fact that the singer does not temper her folk intonation, and yet the results meld impressively. Lars Anders Tomter plays movements from Bach's Cello Suites in keeping with the ethos of the recording, with fairly light textures, a linear focus and a minimum of rubato. Given the ongoing debate about the instrument or instruments for which the suites were written, there can be few complaints about the transcription to the viola. Complaints about intonation, would however be legitimate, and there are a number of places where the pitch is worryingly insecure. And arguments about folk intonation are less likely to wash here. As ever, the ECM sound is excellent. The cathedral venue may be a practicality for the sake of the organ, but it benefits all the musicians. The sound is atmospheric, with a short but perceptible decay, and no apparent effect on the clarity of the details. The disc is as beautifully packaged as any from ECM. A bit more info on the slip case could be useful for prospective purchasers, although 'Folk songs and music of J.S. Bach' sums up the contents well. There are plenty of people out there who revere Bach as a god, and they might balk at his taking a supporting role. Otherwise, I suspect this disc is likely to be very well received.